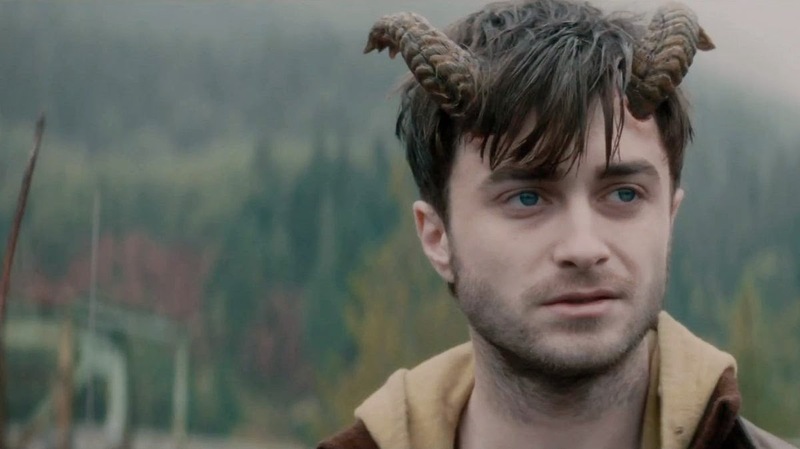 Horns is a 2013 fantasy, horror, romance, mystery, black comedy told in flashback that plays a bit long at just over two hours. The film, directed by Alexander Aha (Piranha 3D, The Hills have Eyes) is based on the 2010 dark fantasy book by writer, Joe Hill (son of Stephen King). It tells the story of tragic lovers Ig Parrish (Daniel Radcliffe) and Merrin (Juno Temple) who fall in love as children and remain together through quite a few post high school years. Ig wakes to discover that his ethereal soul mate has been raped and murdered and he is the suspect in most everyone's eye, after a falling out at a local diner the night before. Set in gorgeous British Columbia, standing in for a moody Seattle, and set to an eclectic and interesting soundtrack, HORNS débuted at the 2013 Toronto Film Festival and will be released on Halloween 2014. Radcliff has proven, post theatrical Equus, that he is not afraid to take on nonconventional roles and give it all he has got and this film demands a great deal from him. Temple (Notes on a Scandal, Atonement) is an enchanting and ethereal on screen presence, full of initial innocence and inner light. The two seem star-crossed over the years and the assumption by all is that they will make it legal. For some unknown reason, Merrin calls the relationship off but what really happens afterwards is a mystery. Ig awakes one morning, after a year, to a newly sprouting set of horns but notices that when he comes near people, they unload all of their innermost thoughts and desires. When touched by Ig, they show him scenes from their pasts that hold high emotion and drama. Ig knows to avenge Merrin and save his own life, he and the Horns must put the pieces together. Big brother and jazz musician, Terry (Joe Anderson- Across The Universe) figures in as does third wheel and wingman boyhood pal Lee (Max Minghella- The Social Network, The Internship) who has long sported a secret crush on Merrin and is trying to be legal counsel to Ig. Other noteworthy appearances are by Kathleen Quinlan as Ig's mother Lydia and Heather Graham as a fifteen minutes of fame waitress who witnessed the break up. The film's inner connections just aren't quite tight enough to jell perfectly for this viewer. It boasts some great special effect work and a unique storyline and it is interesting to follow the truth journey as the horns grow and grow. We never really get if the horns have good intentions or evil one's but not many folks take notice. They are the ultimate ID releaser. Radcliff is intense and determined as he continues to try and leave Harry P behind once and for all and it is a good thing Shea LeBeouf was passed on this role. The climax drags and we do grow weary of the quest as karma pays a visit to a few key players. It is a bit delicious watching each emotional confessional reveal and wish, we too, could be so open and honest about our desires and deepest, darkest most depraved wishes. Things get weird when the snake army appears and things feel a little Louisiana voodoo for awhile and be prepared for some plot holes and a few things that just don't get explained well enough. Watch for the red evolving throughout, from a vintage Gremlin, horn sprouts, cherry bombs, Merrin's hair, some visceral gore, the diner's logo and ultimately Ig himself. Could it be the Devil in all of us?